Rachel offers voice lessons and audition coaching to all levels of development, from young beginners to more experienced professionals. How to harmonize, studio and performance preparation, music theory, sight singing, building a repertoire, and more! Private singing lessons are $55 for 30 minutes, $70 for 45 minutes, and $85 for 1 hour. Beginners to pros are welcome. Singers may choose the lesson time based on their individual needs. Lessons are given in the Willow Glen area of San Jose, California. As a classically trained singer with a great love for musical theater, Rachel is widely versed in repertoire and encourages students to be well-rounded while always being true to the style of the music. 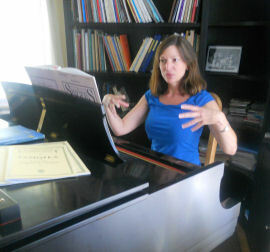 Rachel is committed to a free voice, constantly emphasizing a healthy technique. An experienced actress, she encourages her students to delve into character and textual accuracy. Because Rachel believes that performance experience is vital to honing the craft of singing, she holds three student recitals per year.